How Long & Fast Do I Need to Bike to Lose 500 Calories? Candice Hughes has been writing for more than 6 years. She is currently a contributor to a website about raw food, fitness and diet. Her areas of expertise are women‚Äôs health and nutrition. Hughes received her Bachelor of Arts degree in English with a minor in psychology from Indiana University in 2010. Bicycling is a popular, low-impact exercise that can help you accomplish your fitness goals. Cycling will tone and strengthen your muscles and thereby increase your metabolic rate, allowing you to burn more calories, even while at rest. Many factors, including your metabolic rate, affect the speed and duration of bicycling you need to burn 500 calories. According to Harvard Health Publications, a recreational 12 mph bike ride will burn 298 calories every half-hour for someone who weighs 155 lbs. This person would have to bike for about one hour to burn 500 calories. For someone who weighs 150 lbs. and bikes at a more vigorous speed of 13 mph, 612 calories will be burned each hour, as per the President’s Council on Fitness, Sports and Nutrition. To burn off those 500 calories, you will need to bike longer if you plan to ride at a slower speed. 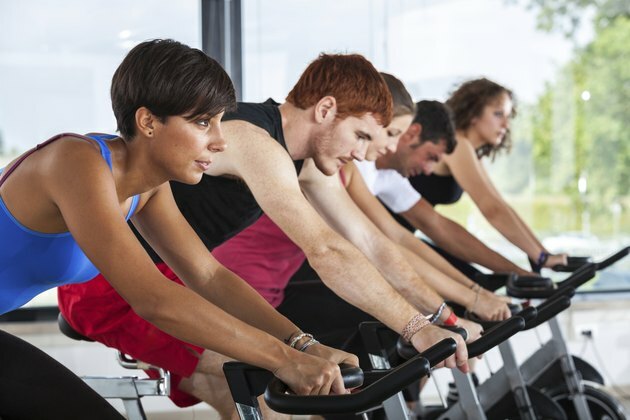 Depending on your personal body composition, how long and fast you need to ride to burn 500 calories will be unique, but general guidelines can help. Someone with a larger body composition or more body fat will burn more calories per hour than a smaller person. A higher number of calories are burned because it takes more energy for the muscles of a larger person to move his body. A 200 lb. person will burn 364 calories per hour riding at 10 mph. At the same speed, a 240 lb. person will burn 436 calories. As you age, your body will lose some muscle mass and gain fat. At this point, you will stop burning calories at the rate you were when you were younger. Men also have more lean muscle to comprise their body weight than a woman of the same age and weight, so they burn calories at a higher rate, even while resting. If you ride your bicycle up and down hills, the amount of calories you burn will change. Climbing a hill increases your calories burned because you have to work against gravity to push yourself and your bike to the top. Wind also is a factor. If the wind is blowing in the opposite direction as you, you will burn more calories. These factors affect calorie expenditure exponentially, so the higher the wind speed and the steeper the hill, the more calories you will burn overcoming those obstacles. According to the American Council on Exercise, including intervals into your workout increases your calorie burning potential by using both your anaerobic and aerobic systems. Not only will you be using oxygen to turn carbohydrates into energy, you also will be burning carbohydrates directly. To perform intervals, alternate between a slower or more leisurely riding speed such as 10 mph and a more vigorous speed, such as 15 mph. How long you ride at each speed is up to you and how you feel.